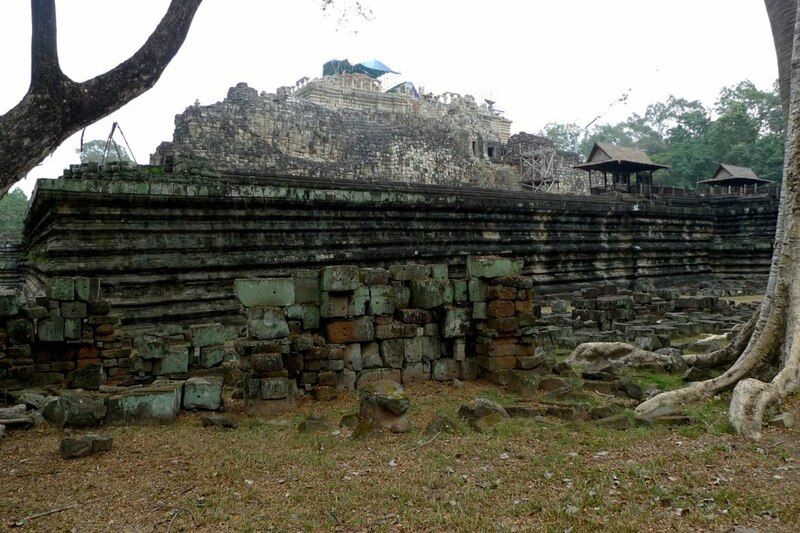 The temple of Baphuon was meticulously disassembled by a French team with every piece surveyed and documented. 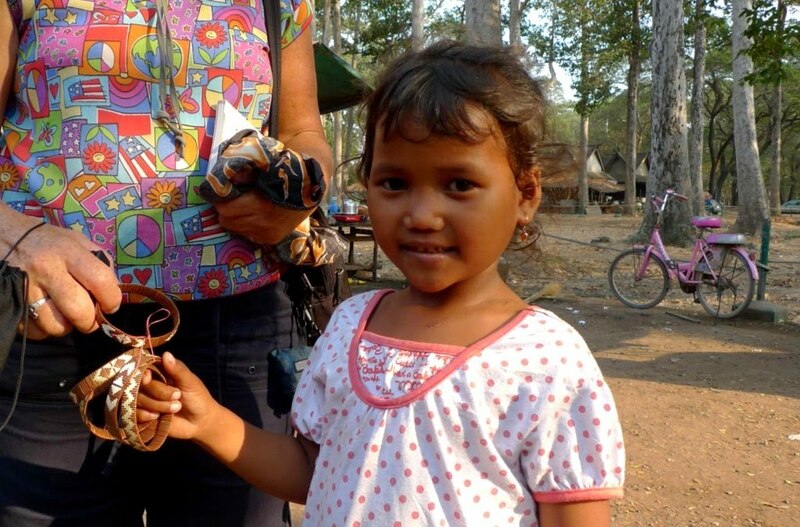 Then the work stopped for 20 years during the civil war and the records were destroyed by the Khmer Rouge. When work resumed in 1995 they had 300,000 stones and no plans. Work continues. Bayon has 1.1km of bas-relief carvings featuring 11,000 figures (I'm told). 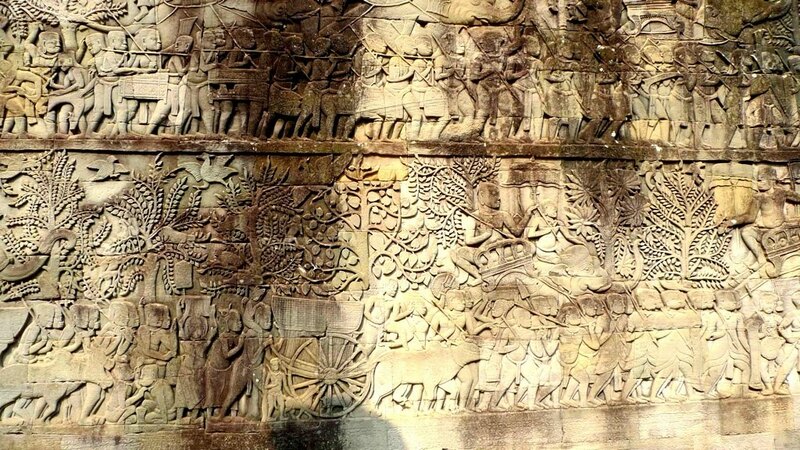 The stories are from the history of the Angkor Empire - they had quite a few wars, it seems. 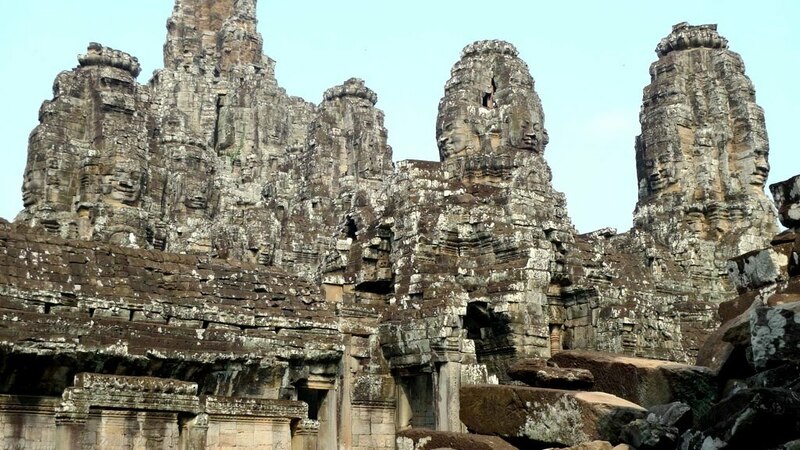 Bayon is in the precise center of Angkor Thom. It has 54 towers decorated with 216 huge heads! On our second day, we visited the ruins of Angkor Thom - a fortified city built in the 12th century. 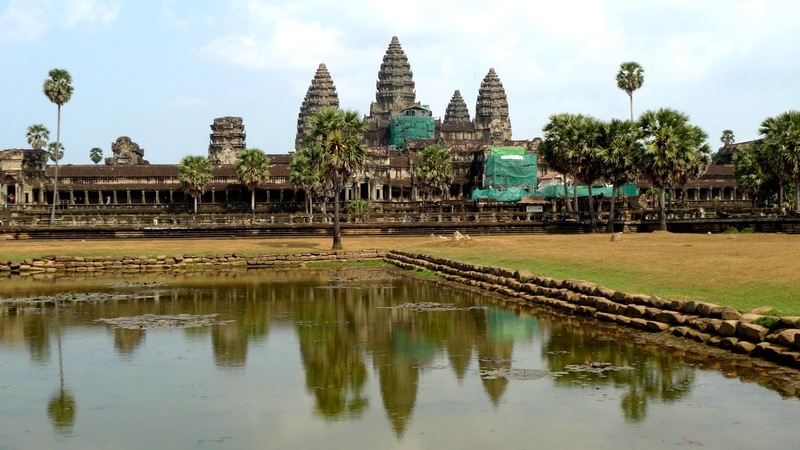 It's 10 sq km is bordered by a wall 8m high and 13km long, and a moat 100m wide. 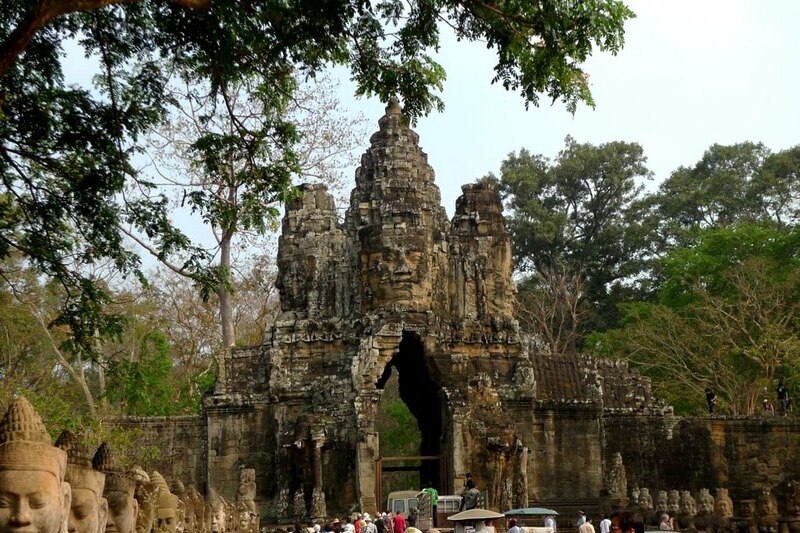 This is the causeway to the southern gate which is decorated by gods and demons pulling on a long serpent. The Churning of the Ocean of Milk again! This little girl pestered me to buy 10 bracelets for a dollar. I offered to photograph her for a dollar instead. Ginger took 1 bracelet. Shortly after, her older sister turned up and whined for maybe 10 minutes! It's hard to convey the scale of this edifice. 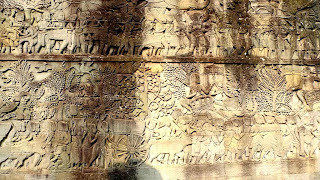 The bas-relief carvings at Angkor Wat wrap around the outer wall with a length of about a kilometer! They tell stories from Hindu Epics. 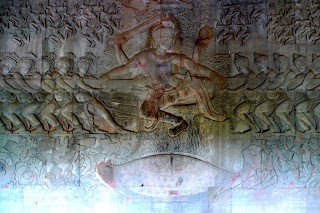 This is the center of The Churning of the Ocean of Milk in which gods and demons, with aid from Vishnu, churn up the ocean to extract the elixir of immortality. 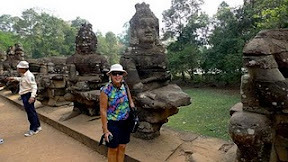 The ruined temple complex of Angkor Wat is one of the wonders of the world and we made a special side trip to see it. 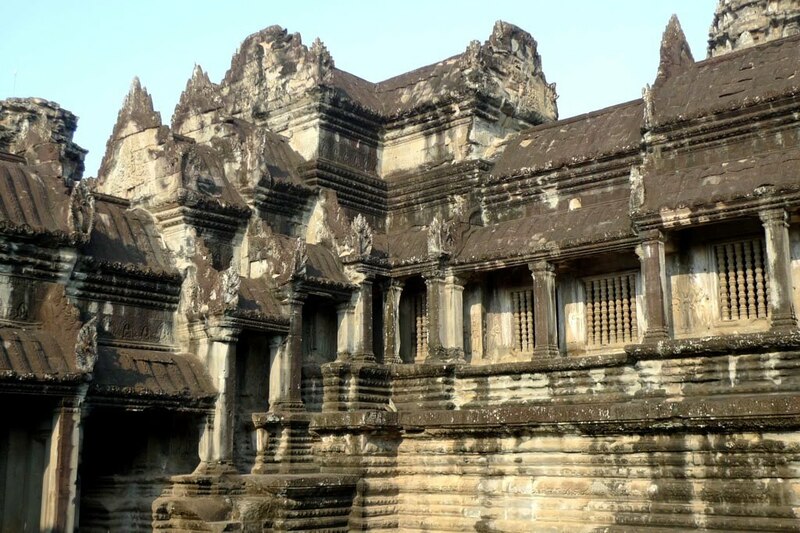 It was built in the 12th century to honor Hindu Gods, but was later abandoned to the jungle for centuries. It was rediscovered in the 19th century and there have been massive restoration projects over the past 50 years. We've come to Siem Reap (which means "Siam Defeated" BTW) to visit Angkor Wat. This is 'our' driver and his Tuk Tuk. 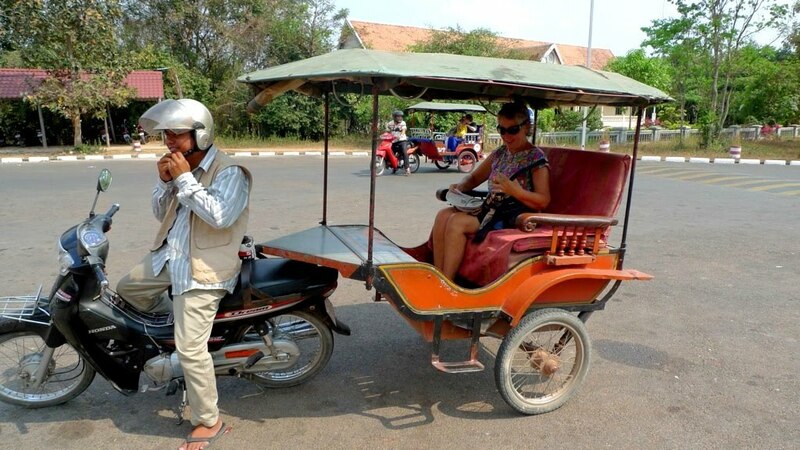 Cambodian Tuk Tuks are basically trailers behind motorbikes whereas the Bangkok Tuk Tuk is a purpose-built three wheel mash-up. But the biggest difference is that Cambodian Tuk Tuks putter along at 20mph while the Bangkok Tuk Tuks roar at crazy speeds down the wrong side of the road! Our last Bangkok driver (coming back from Wat Pho) had a particularly insane death wish! Friday was our last day in Bangkok. 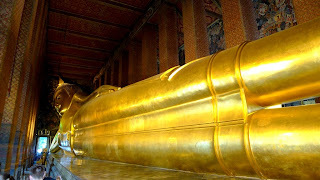 We visited Wat Pho, home to the giant Reclining Buddha. 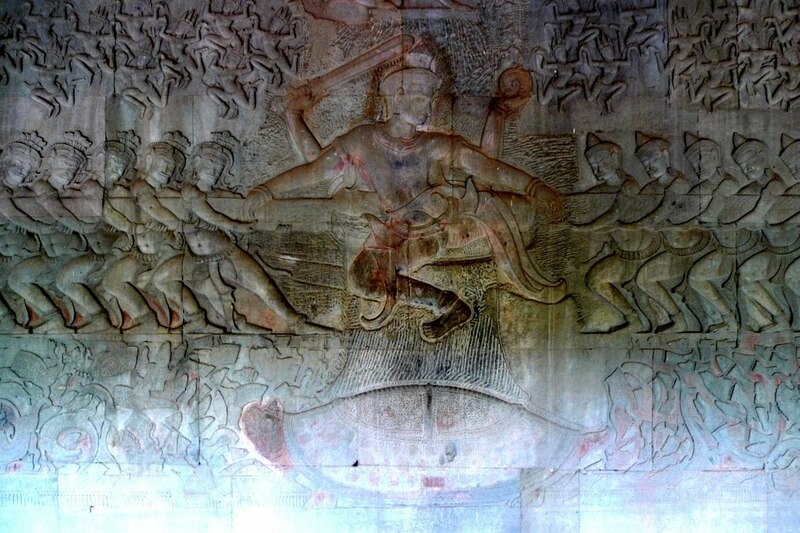 For some reason there seems to be an inclination to build large status of Buddha in various poses. We've seen them standing and sitting. This one is reclining. Even without the Reclining Buddha, Wat Pho is nice enough to be worth a visit. Thursday evening we had a Dinner-Cruise on Bangkok's Chao Phraya River. 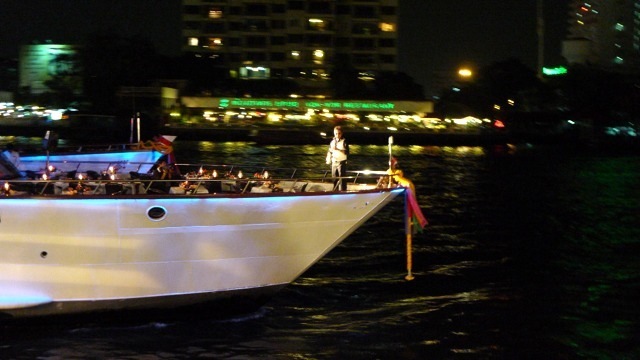 The Grand Perle hosted 200 and had live music, traditional Thai dance, and a buffet dinner. As it came in to pick up it's passengers, there was a tenor sax soloist on the foredeck playing through the ships' audio system - very classy! The trip was a nice view of the river as the Grand Palace and several Wats were lit up. The food was OK and the wine was very expensive! We enjoyed it. Thursday we visited the Floating Market at Damnoen. This must be the least efficient market imaginable. Tourists are paddled in small boats down lines of small boats containing souvenir sellers. Other smaller boats cruise up and down selling food items. 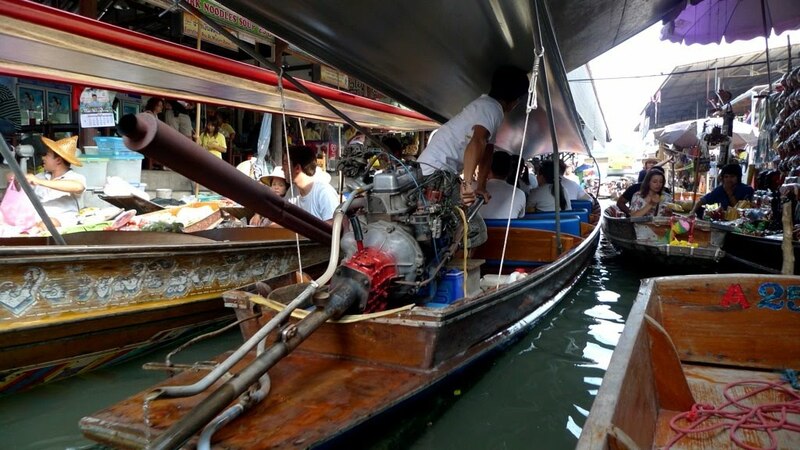 You can also hire a "long-tail" motor boat to sit in this traffic jam! Yet more souvenir shops are on dry land nearby. We got to the market on a larger long-tail boat which was scary. The boat roared along the narrow canals and rolled alarmingly on each bend! 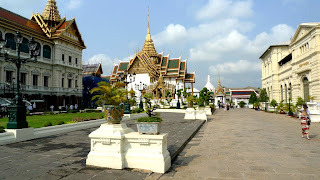 On Wednesday we visited the Grand Palace. This was the King's residence until around 100 years ago. Now it's used on formal occasions. It's a beautiful collection of buildings, immaculately maintained. 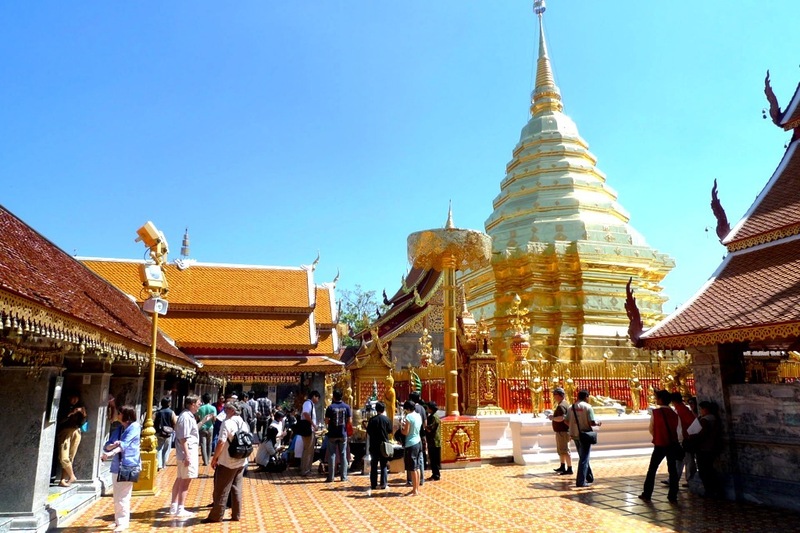 The complex includes a temple (containing the Emerald Buddha) and a mausoleum. This is the most uncomfortable taxi I have ever used. We sat in the back and I hit my head every time we went over a bump. Today we took a trip to Ayutthaya, an old capital that was abandoned after it was sacked by the Burmese several hundred years ago. 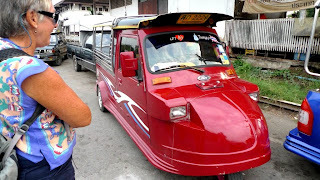 It was called a "Multi-transport Adventure" and involved a train ride, 'Kermit' Tuk Tuk, river boat ride, and pedal-driven Sam-Lo. 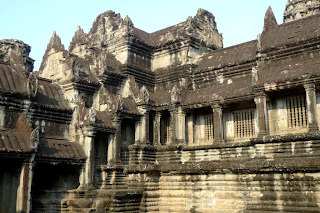 Lots of temples and palaces - both ruined and in-use. We have arrived in Bangkok. First we had a day with no planned tours in which we visited the National Museum. Three month old ooloo(?) going for Ginger's camera. Our second activity of the day was a visit to Tiger Kingdom. This nature park breeds and hand-rears tigers, and lets tourists pet them. 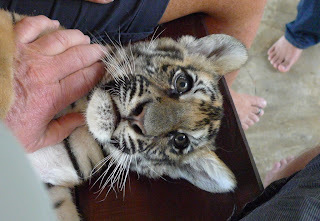 Various sizes of tigers are available; we opted for the smallest. This is Mimi who is two months old and has just been distracted from trying to lick me. 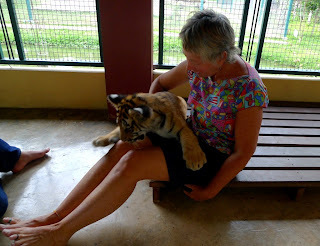 We visited Chaing Mai Zoo and, in particular, the aquarium. The aquarium looks like a recent addition and has a good collection of freshwater and ocean fish. They have a large tank for each ecosystem with tunnels for viewing. 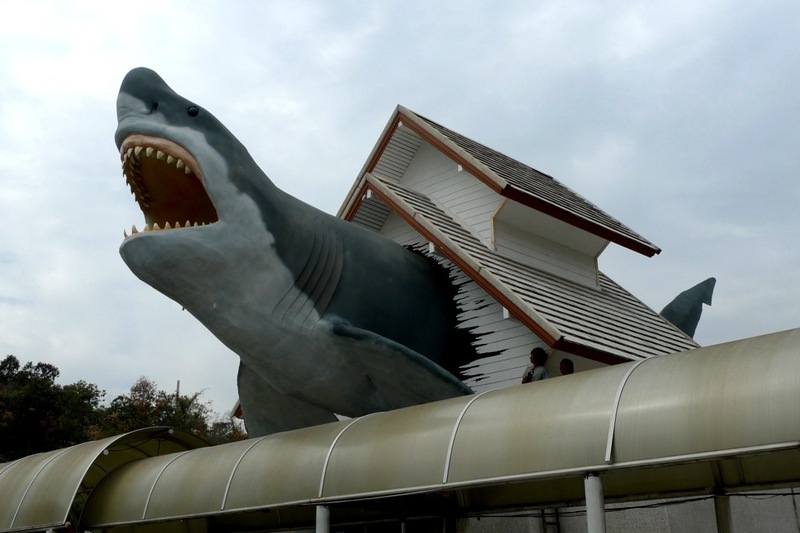 This shark is over the entrance. 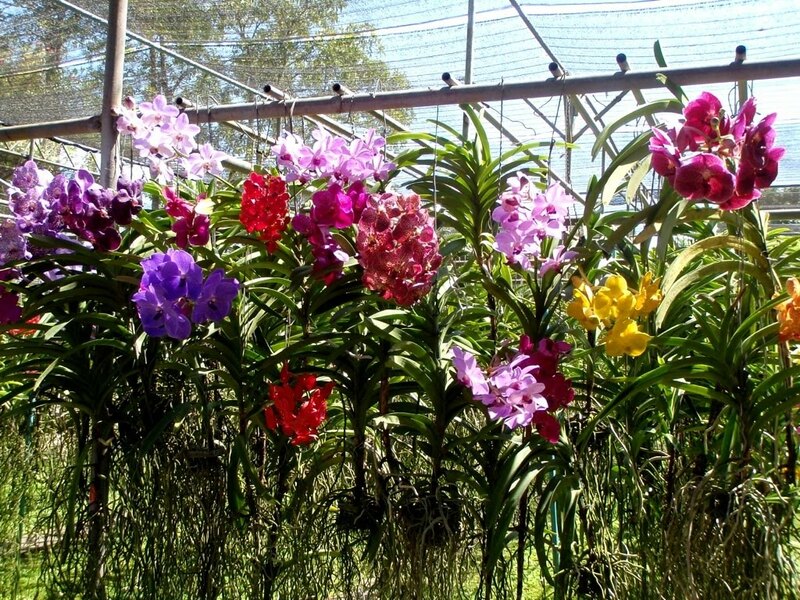 Chaing Mai Zoo is large and spread out and provides shuttle buses to transport visitors around. They have most of the animals you'd expect, including a couple of giant pandas. Doi Suthep is an important temple on a hill close to Chiang Mai. Today is a Buddhist holiday and the temple was very busy. 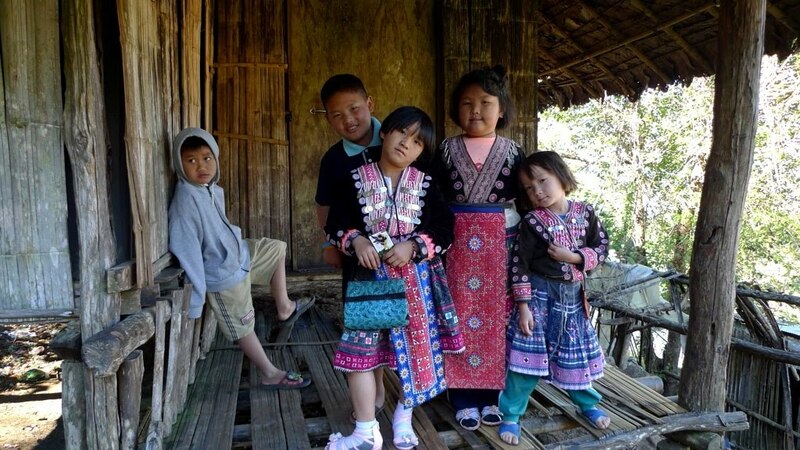 Children in a Hmong village on the slopes of Doi Suthep near Chiang Mai. The photo cost me 20 Baht (around 70c). 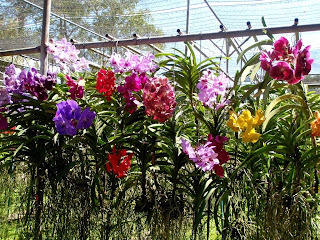 On Tuesday we stopped at an Orchid Farm for lunch. Ginger attended school in Chiang Mai - Thai Cooking School. 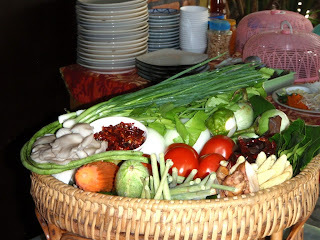 The class visited the market to identify the various Thai vegetables and herbs, and made five dishes. They then ate what they prepared. Quote: "Yum!" 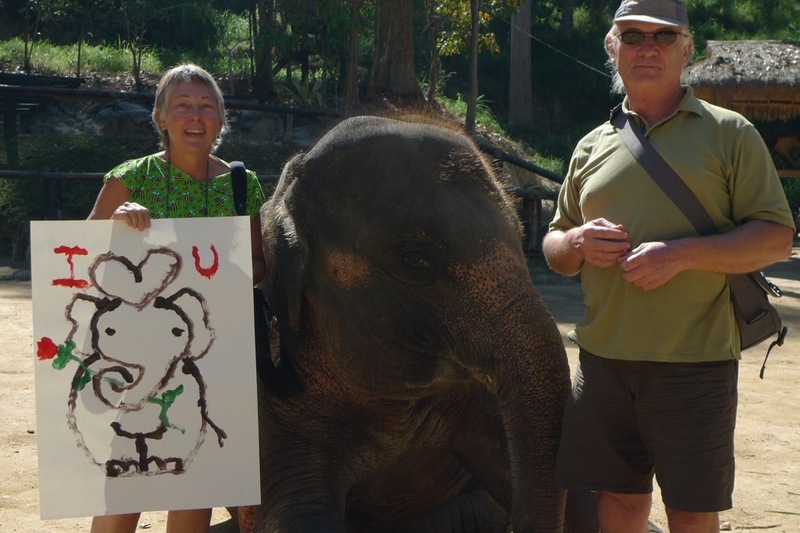 Today we visited Mai Sa Elephant Camp. We fed elephants bananas, watched them splash in the river, and saw an elephant show. The highlight was the elephant painting demonstration. Thongsa here painted this picture, which Ginger bought - as it's Valentine's Day. 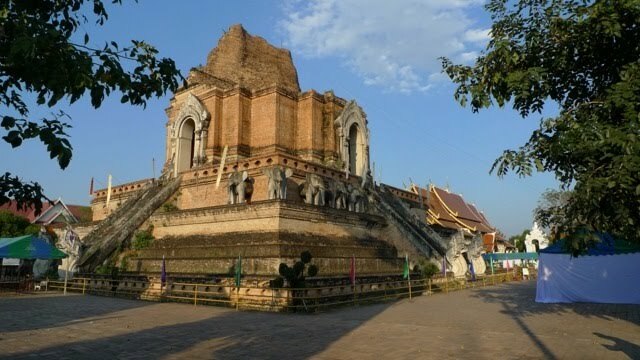 Now we're in Chiang Mai in northern Thailand. On our first night we walked into the old city and viewed the first of what will probably be many Buddhist temples. 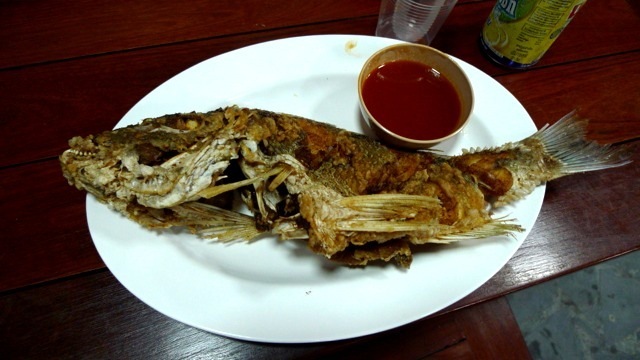 Ginger ordered fried fish in the Similan Island National Park restaurant and that's exactly what she got - one fish, deep fried. She seemed to enjoy it though! The accommodation was modest but adequate. The cottage had air conditioning but there was power only after 6pm. 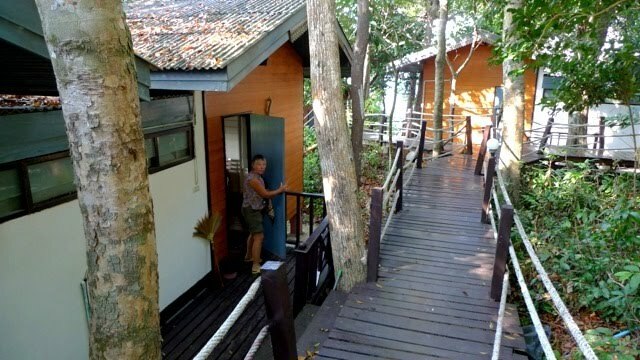 Our bungalow was accessed via a stair and boardwalk that exhausted us very quickly! We bought a 2 day 1 night dive trip to the Similan Islands. Day 1 we left Khao Lak in a speed boat and made two dives, with lunch on the beach between. 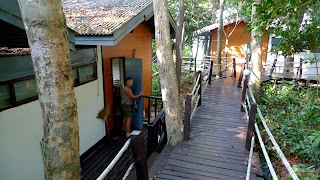 Then we were dropped off to spend the night in a National Park bungalow. Day 2, two more dives and return to Khao Lak. The dives were reasonably good. The second day was better than the first. It was mainly diving around rocks - not much hard coral. 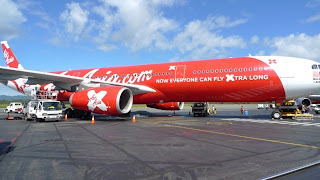 We've left Australia for a few weeks to visit Thailand. We plan some dives in Phuket and a week in both Chiang Mai in the north, and in Bangkok. We will also spend a few days visiting Ankhor Wat in Cambodia. Dos Gatos is in a marina at Hervey Bay, and Tigger is in a cattery in Bundaberg. While we were cleaning up this morning after our passage, a snake fell into the cockpit! Yikes! We’re not sure exactly where it was hiding. This is not a minor thing in Australia which boasts some of the most deadly snakes in the world. After some cowering inside with the door closed, we cleared a route for it to leave and it went into the ocean and swam off. 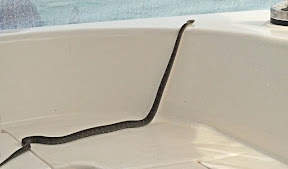 We identified it as a Brown Tree Snake - “Venomous but not Dangerous” (It’s a kind of snake, like sea snakes, that has its fangs at the back of the mouth so it can’t bite big things, like us. However, we were happy to see it go. We spent a total of three weeks at Lady Musgrave Island; we visited the island and made 8 dives on the reef. For the last week or so, it blew very hard - typically 25-30 knots. We moved closer to the reef, which helped at low tide, but at high tides on the Great Barrier Reef the reef is well submerged and the swell comes over the top. 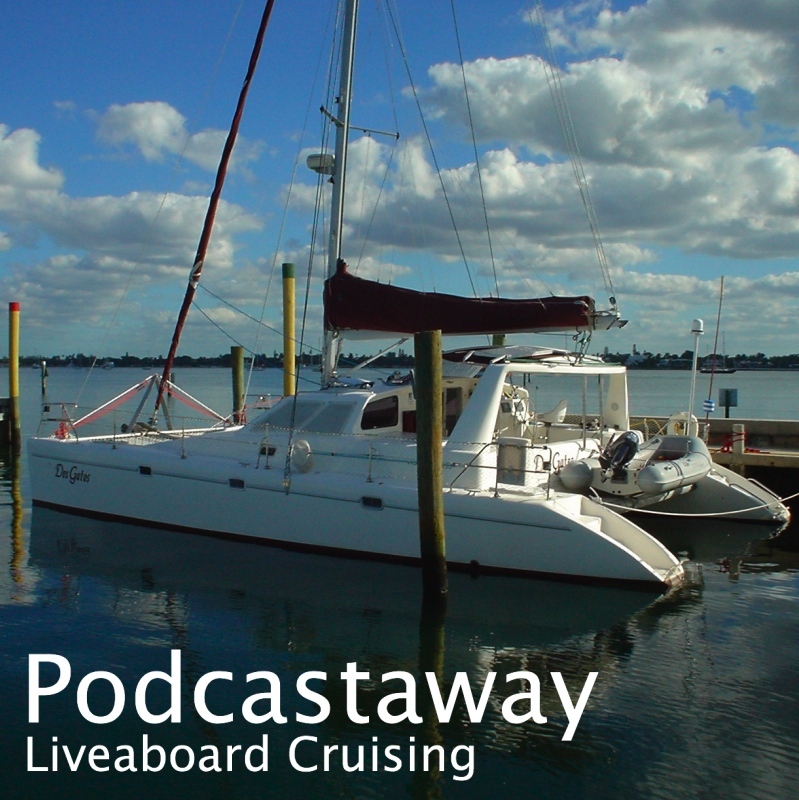 We’re due in Hervey Bay this Saturday and were becoming concerned about getting there ~100 miles south. Then last week the weather people announced that two cyclones were heading towards Queensland; Cyclone Anthony, a small one, and Cyclone Yasi, a huge one. They said towns north from Gladstone would be affected when it arrives this Thursday. Gladstone is the nearest town to Lady Musgrave Island! Luckily a small weather window arrived. Monday was forecast as E/SE 20/25 easing to 15/20, and Tuesday was to be E/NE 15/20 increasing to 20/25! Seas were forecast at 6-8 feet! All poor news for an 80 mile slog southeast to Fraser Island. But we seemed to have little choice. The two other boats in the lagoon with us left Monday. We left at dawn on Tuesday to give as much time as possible for the seas to settle. 14 hours later we dropped anchor off Fraser Island. It actually wasn’t too bad for an upwind trudge. Maybe our expectations were so low it was easy for us to be pleasantly surprised! Anyway, we’re now well south of any excitement when Yasi arrives Wednesday night. We’ll stay here a couple of days and go into the marina on Saturday. Then we’re off to Thailand for three weeks!